The Rev. A. L. Wilson, pastor of the old church on Conestoga road from 1880 through 1882, performed a service of lasting importance to a service to his parishioners and those who were to follow, when he painstakingly noted all the information available on the founding and early days of this historic church. After almost seventy years the clear legible handwriting covers page after page in what must truly have been a labor of love on the part of a conscientious man. Surprisingly enough, even the ink is scarcely faded. Mr. Wilson tells of an “old, time-honored building which has been known for generations past as the Radnor Methodist – Episcopal Church”, standing on “one of the most beautiful hills of Radnor”. And so long has this church been associated with the hill that the latter is generally known as “Methodist Hill”. Its history goes back to the early days of Methodism, since many of the pioneers of that faith in the country “have declared the unsearchable riches of the Christ on the gorund”, which seems almost hallowed because such men as Bishop Coke, Richard Whatroot and Francis Ashbury had been there to counsel and encourage the church in its infancy. According to the most accurate information available to Mr. Wilson, the first Methodists to visit Radnor were two local preachers named Adam Cloud and Matthew Greentree. This was probably several years before 1780 since it was in that year that Radnor became “a regular preaching place” which was supplied by the circuit preachers. The first class was organized in the “Mansion House” then occupied by the James family, early forebears of a well-known citizen of the present time in Radnor township, Hon. Benjamin F. James, and his brother, Evan L. James, of Wynnewood. As described in last week’s column this old mansion house still stands at the corner of Montrose and Conestoga roads, though the years have brought some enlargement to the original structure, which is now one of the most beautiful among the really old homes in Radnor township. It would seem that many participated actively in the building of this first meeting house At any rate Jacob Gyger, David and Isaac James hauled water from the creek by way of a barrel on a sled in order to obtain this water for mixing the mortar which was to hold the logs together. In spite of difficulties, the meeting house was completed and dedicated in 1784. An account of those dedication services would make interesting reading but Mr. Wilson tells us that apparently no record of them was kept. But, if this is lacking there is certainly a full list of all the trustees, elders and preachers who were connected with the little church during those early days of its existence. These have been carefully preserved in the history of “Old Radnor”. A touch of early Winter was in the breeze that rustled the dry brown leaves in the old Church yard and followed us up the shallow, well-worn steps into the interior of Old Radnor Methodist Church last Sunday afternoon. We had paused for a moment outside to examine the old door knob, punctured, it is said, by a bullet. At any rate, the hole is there. On the inside of the door is the ancient lock, and hanging under it the quaint old wrought iron key, some four inches in length. The Reverend James Haney, minister of the CHurch, ventured the guess that it weighs at least a pound. At once the quiet serenity of this old place of worship, seen in the light of the late afternoon sun as it came through the high windows, seemed to envelop us. It is the peace that long uninterrupted years of worship within its four walls has brought. For this present Church building dates back to 1833, and its log cabin predecessor to 1783. A hundred years had then passed since William Penn had founded his colony of 40,000 acres which he called the “Welsh Tract”. The land on which this old church stands was originally part of the tract, embracing as it did the present townships of Haverford, Merion, Radnor and part of Goshen. The first Radnor Meeting House had been built by early Welsh Friends in 1695, while Old St. David’s, originally called The Radnor Church, was begun in 1715 and completed in 1717. The Methodist movement was born at Oxford, England, in 1729, when John and Charles Wesley and a few others began to meet for religious exercises. Eearly in 1734, a company of three hundred emigrants, led by James Oglethorpe, landed in Georgie, the Wesleys among them. By 1739 Methodism had gained much headway among Philadelphia’s 10,000 inhabitants. 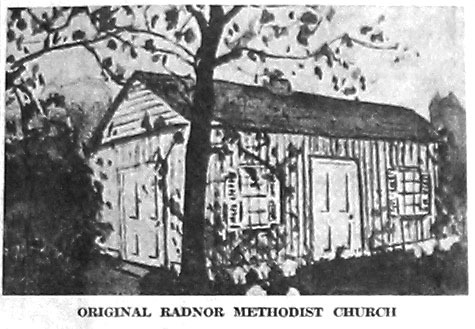 By 1780-81 a number of Methodist circuits had been organized and about this time Radnor became a meeting and a Society numbering forty members was created. The one-story log cabin meeting house, built in 1783 on what was soon to be known as “Methodist Hill” on the much travelled Conestoga Road is the oldest Methodist Meeting House in Delaware County. In point of age in comparison to Methodist churches in Philadelphia it is surpassed only by St. George’s. The quaint illustration accompanying this article was made by Miss Edith Powell in 1908 from a description of the little log cabin given by Mrs. Mary Clemmens and Miss Hannah Gyger Clive, who were then in their eighty-ninth year. Facing south this small building, twenty-five feet wide by thirty feet long, had two small windows, one on each side of the doorway. Inside there was one aisle with a long mourners’ bench in front of the pulpit. It was heated by a stove in the center of the room with its chimney going up through the peaked roof. The plot of ground on which it stood was deeded to the Society by Evan James. The really lovely interior of the present church building is a restoration of the original Colonial one as it looked when the second meeting house was erected in 1783. It has its divided chancel and central altar with a recently installed Hammond organ and a set of chimes given in memory of the Reverend John Watchorn, who served the Church from 1940 until 1943. Mr. Haney amazed us on Sunday when he showed how the backs of many of the pews can be reversed, so that the occupants face either to the front or the back of the Church. During Church services all face front, of course. But when the room is utilized for Sunday School purposes the pews are arranged so that the occupants of any two of them face each other for classes. Other Sunday School classes are held in the large basement room where on Sunday Mr. Haney showed us an interesting chart prepared by Mr. Herbert L. Flack in preparation for the church’s present drive for a $40,000 building fund. This chart shows that in 1780 the CHurch had a membership of forty as compared to its present two hundred and ninety, while the Sunday School has had the amazing growth of from twenty-seven to one hundred and sixty members, from 1843 to 1950. In 1783 the plot of ground on which the Church stands cost the congregation $1.69. Other interesting figures show that in comparison to the present $40,000 prospective building fund, $161.40 was raised in 1801-1803 by “subscription and collection”, while in 1881-82, $1631.21 was raised, “all of which was paid by subscription before the day of re-opening”. In 1931 members and generous-minded and public spirited citizens of the surrounding communities contributed $8,000 to defray remodeling costs. Back of the modern furnace that heats the church of the present day Mr. Haney showed us a narrow doorway formerly closed by a heavy iron door. In days now long past this led into the vault used for coffins when frozen earth in winter made permanent burial impossible until spring should come. It reminded us of the small building in Radnor Friends Meeting burial ground once used for a similar purpose. Strangely enough this one time vault in the basement of the Radnor Methodist Church is now a cheery and most adequate kitchen. Its stone walls must be at least two feet thick, as shown by the masonry around the windows. After leaving the church grounds, Mr. Haney drove us along Conestoga road where at its intersection with Montrose avenue still stands the original Mansion House, once owned by the James family where the first Methodist service of any kind in this region was held. That service was a prayer meeting, the date of which is not recorded, though it was probably in the year 1778. The beautiful old house, now somewhat modernized, still has the original stone walls of the early structure intact. It is now occupied by Mrs. Percival Parrish. The parsonage constructed in 1891-95 still stands at 1003 Conestoga road, where it is occupied by Mr. and Mrs. Haney and their family. This invitation is among the bits of early evidence that the Eagle School was among the pioneers in the “lyceum movement,” which was to become an integral part of the life of the early settlers in this section. Records show that as early as 1935 the Chester County Education Convention organized a County Lyceum with a full roster of officers. As already stated in this column, Radnor Lyceum was organized in 1838 with Hugh Jones Brooke as president. Among the names connected with this Lyceum that still live on in present-day families are those of John Pechin, John Mather, and Adelaide Cornog. Among these lyceum meetings held in Eagle School is one of 1832 so graphically described by one of the audience that his account is well worth quoting in full. It was given to the Board of Trustees of the old School by the late Joseph Levis Worrall, of Radnor, and recorded in Mr. Pleasants’ history. “In 1832 we had an exhibition of the telegraph in winter time. Two operators came up to Edward Siter, who kept the Eagle Hotel . . . and asked permission to give the people a free exhibition of the telegraph at the Eagle School. The real object of the exhibition was for the purpose of obtaining an appropriation from the Pennsylvania Legislature through representatives favorable thereto . . . Edward Siter sent word around on horseback to the different stores, blacksmith shops and taverns, and put a notice in the Delaware County paper “Upland Union” of Chester, and in the “Village Record” of Chester County. “We had a crowd of persons present at the exhibition; the building was jammed, and many could not get in. Dr. Joseph Blackfan and my father, Fred Worrall, were chosen by the people to sit by each telegraph operator, who took their positions at opposite corners of the room. Edward Siter, John Pugh and others stood in the doorway of a board partition . . . as judges to see that no sign was given of what was written, and then a message was sent across, the machine writing by dots and dashes on paper: Dr. Blackfan writing down a message which the operator sent to the man at father’s end, who read it out aloud, and then a message was sent back. The judges were first given the message which Dr. Blackfan wrote down, to see that no fraud was practiced. The message was always read off correctly and the effect on the audience was astonishing. They closely questioned Dr. Blackfan and father to know if there was any collusion. Father and many others thought the exhibition one of supernatural powers. Edward Siter stated that he could not account for it. Others thought that it was the work of the Devil. Thus did our forebears in this section first learn of the mysteries of telegraph, which was so soon to become one of the country’s greatest means of communication. Other rural schoolhouses of an early date that have been preserved to the present generation, and are well known to many of us are the Camp School at Valley Forge, restored by the Valley Forge Commission; Diamond Rock School near Howellville and the Octagon Schoolhouse near Newtown Square. Until the Common School System of Pennsylvania came into full operation about 1836 such schools as these afforded the only facilities for the education of children in the rural districts. Many of them were established soon after the arrival of William Penn. Compared to what the schools of today have to offer they were primitive and crude, indeed, yet in their way they served their purpose at a time when nothing else offered itself. Old-time school masters usually acquired their positions by “circulating a subscription list around the neighborhood and inducing the various residents to send their children to school at certain rates.” There is some question as to who was the first master, that honor lying between a Brinton Evans and Jacob Sharraden Werkiser, son of that Christian Werkiser who gave the original acre of land on which the first school building was erected. Another of the old masters was James Boyle, descended from Irish gentry, who also taught at Old Glassley School, in what is now part of Devon, and at the Union School, near Great Valley Baptist Church. Still another was Adam Siter, a lame man, whom the pupils “endearingly called ‘Old Step-and-go-fetch-it.” He also taught in the School house at Old St. David’s Church. These old-time school-masters had no supervision from anyone except possibly from “the committeemen,” though there is not much evidence even of this. Among the relics of the Old Eagle School are some of the primitive instruments by which a rudimentary education was literally “driven into its early pupils.